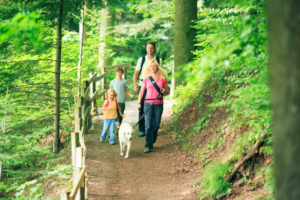 Home » Blog » Windward Community: Take a Hike! Spring is finally here! We’ve had a rough winter in Kansas City and we are ready to get outside and enjoy some fresh air. A great way to spend quality time with your friends, family, or take some time for yourself is to hike in a nearby park or nature preserve. You don’t have to look far! KC has many lush, green trails with caves, creeks, rivers, lakes, and wildlife to enjoy and explore. There are more than you think! From Shawnee Mission Park to Swope Park to Parkville, there are some great nature preserves, parks, and hiking trails in the Kansas City area. You may have a favorite trail you walk regularly, but it could be fun to explore new trails. Get out there and take a hike!